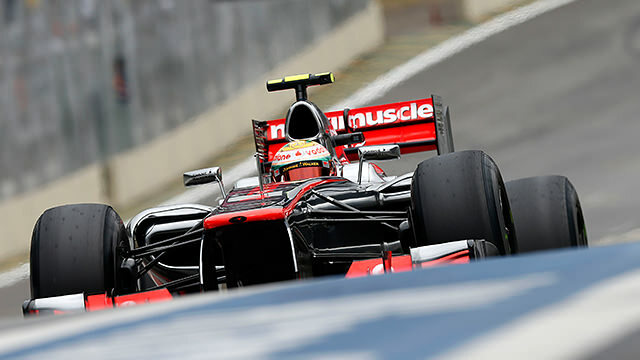 Welcome to F1Minute - Hamilton leads an all-McLaren front row in Brazil. Qualifying in Brazil began with a bang, quite literally, as Romain Grosjean and Pedro de la Rosa collided going into the start/finish straight as they battled for track position in the first session. The Lotus driver lost his front wing out on track, had to make a last minute dash to the pits for a new one, and managed to squeeze in another lap, but didn’t have the pace to make it out of Q1. Into Q2, Michael Schumacher was fast enough for 14th place, with a wet setup on board. It was touch and go whether Fernando Alonso would make it into the top ten at all, but he just scraped through, leaving Paul di Resta and Bruno Senna in his wake. The final ten minutes were tense, with Lewis Hamilton and Jenson Button putting in some great laps for P1 and P2 respectively. Mark Webber was third, with Sebastian Vettel down in fourth - unusually making a mistake or two in his qualifying laps. Alonso could only manage eighth fastest, whilst teammate Felipe Massa wowed the home crowd with the fifth fastest time.